RM Fowler stock a range of 1 inch pitch block chain ideal for use on early cycles, starting handles for many cars and pedal chains for early motorcycles. 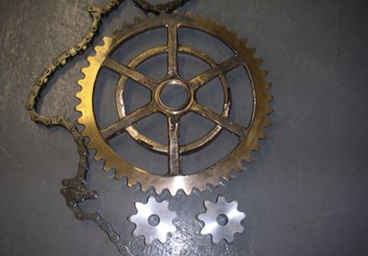 The chain we supply is the laminated type made of laminated steel plates which offers a greater strength than the solid sintered type of chain. Due to the design of this chain the pitch is measured between alternate pins, please see the diagram below which also includes other dimensions. 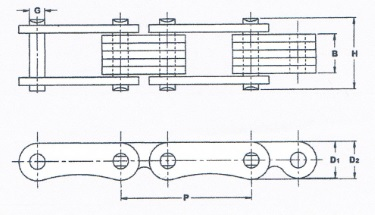 The table below shows the dimensions of the four different sizes of 1 inch pitch chain that R M Fowler stock. All dimensions in inches. 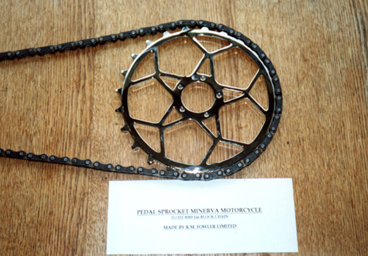 We can also manufacture sprockets with intricate plate designs and standard pinions, two examples of this are shown below.